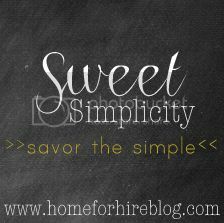 What I am sharing with you today is so simple that I feel almost silly writing about it. But, it's been a money + resource saver for me, so I thought I'd tell you about it anyway. Ever wonder what to do with your veggie guts (or the excess you have after cutting up veggies) or veggies that are on their last day? Well, freeze/use them to make some veggie stock! Put a colander into a large bowl and pour the veggie + water mixture into it to strain. Let the stock cool and then dish up into containers. You can keep it fresh in the refrigerator for a few days or freeze it and save it for later. I'm excited to see what you'll share this week! 1. I'd love for you to share that you're linking up with me today. You can grab the little button down there or just include a link.